Vertical flowers with a tall green stem, some foliage, and small blooms lining at the top of the stem. 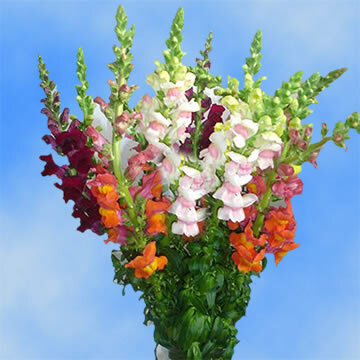 Blooms have a colorful bell shaped flower head growing from each stem. The name comes from the flowers' fancied resemblance to the face of a dragon that opens and closes its mouth when laterally squeezed. If you need specific colors please contact us..Your flowers and roses are shipped absolutely fresh, direct from the greenhouses to you via FedEx. Globalrose sells wholesale flowers and wholesale roses at prices that are usually lower than most local wholesalers. All our flowers and roses are cut specially for you, your loved one or special event (wedding, party, fundraising event, birthday or holiday), 3 days before they are delivered to your door. Color tones for all flowers and roses may vary due to the computer monitor and/or Mother Nature.